Have you ever been casually browsing through second-hand stores when you come across random items that, when grouped together, cause you to become over-the-top excited, as you realize in a “light bulb moment” just what they are destined to become?! The kind of excitement that causes you rush home and get right to work on that project in spite of all the other things around the house that are calling out for attention? 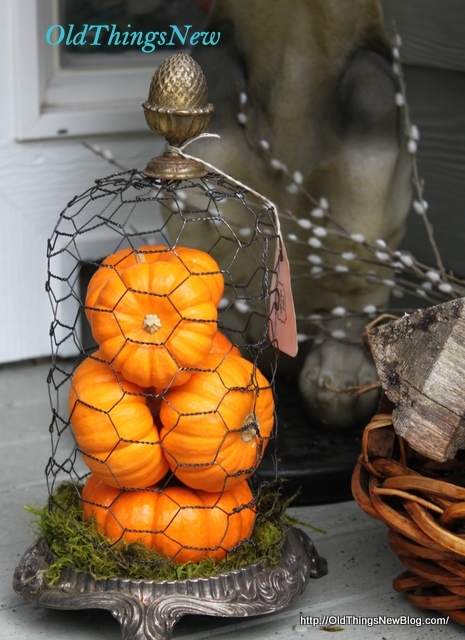 That’s EXACTLY what happened on my last junkin’ trip when I came across the fabulous items I used to make these Junky Chicken Wire Cloches. The last time I paid a visit to The Second Hand Rose store owner Terry took me behind the locked gate into his back yard of broken and not so nice items. I couldn’t believe my great fortune! Here are just a few of the things I came home with that day. An acorn knob, an old faucet handle, two silver plated stands and a couple of pocket watches for Mr. OTN (these will not be a part of this junky project but I do see them in a future vignette). and a can of Rustoleum’s Oil Rubbed Bronze spray paint, also on hand in my garage. 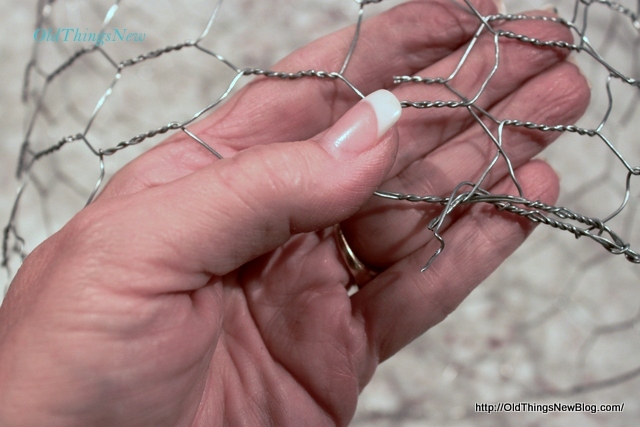 WARNING: Making a chicken wire cloche is simple but it can also be dangerous. I’d advise wearing gloves to avoid injury. That said, I didn’t wear gloves myself because I like to work au naturel so I can get the whole experience . . . OR . . . I was in too much of a hurry to go find the silly gloves! 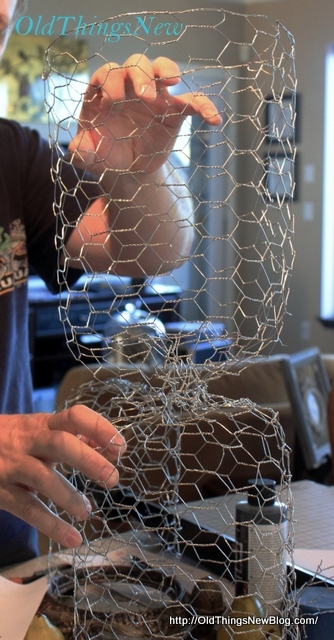 Once you’ve measured the diameter of your base make your piece of chicken wire just a little bit smaller to fit inside the base, then crimp the edges of the wire over to hold the shape (acrylic nails are a great tool for this step). Snip off any excess with wire cutters. When all the ends of the wire are secured you’ll end up with a really tall tube of chicken wire. Once you decide how tall you’d like your cloche to be you’ll start scrunching the wire together at that point. It is helpful to have a big pair of pliers to aid in the scrunching. When completely scrunched (fun word) cut your chicken wire with a sharp pair of wire cutters. You can see that this piece of wire actually made two cloches. Next, you can add any kind of top you’d like . . . a doorknob, a cabinet pull, an old piece of jewelry, etc. 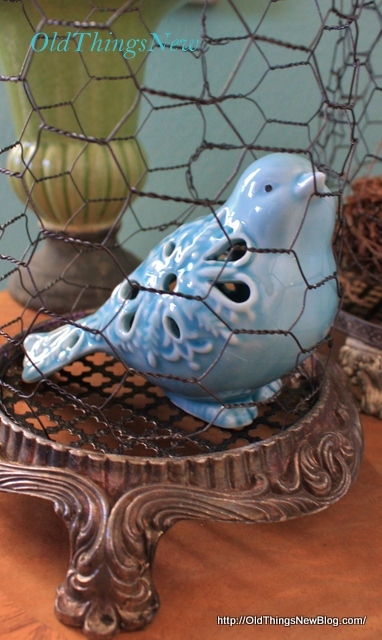 I attached the cloche topper I used here by using my pliers to scrunch the chicken wire around it. It held pretty tight just as it was but I added a piece of flexible wire to secure it fully. This is the acorn topper . . .
. . . and this is the old faucet topper. After attaching the decorative tops I taped them off and sprayed the chicken wire with the oil rubbed bronze spray paint. I also cut a circle out of the decorative metal to make a “floor” for the cloche and spray painted that at the same time. That’s pretty much it. Fill your cloche with some fun things from around the house and there you have it. I must admit I am a bit smitten with cloches. 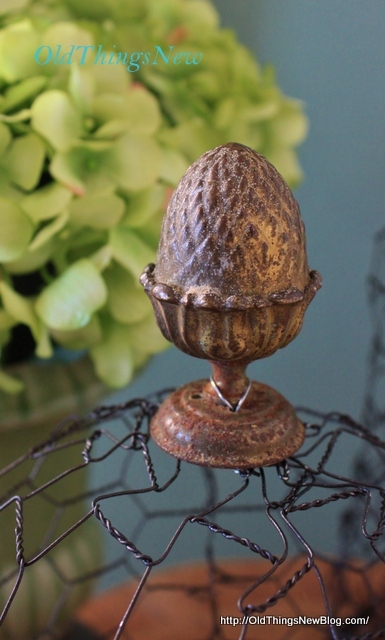 I have one on my coffee table that I change with the seasons, and I did a whole post on Christmas Cloches last year. If you’d like you can view that HERE. 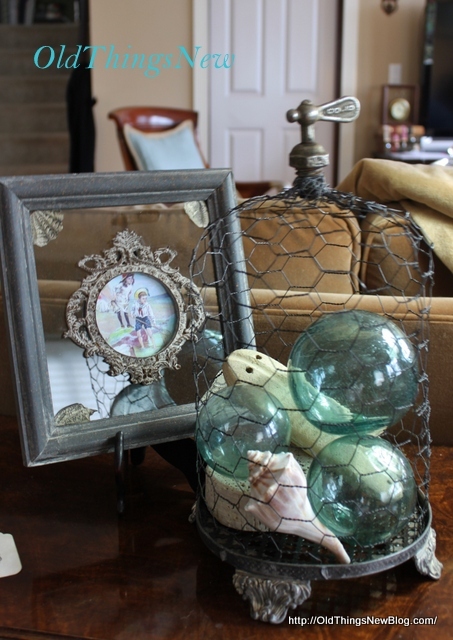 Do you use cloches in your home decor? What do you like to fill them with? Hmmm . 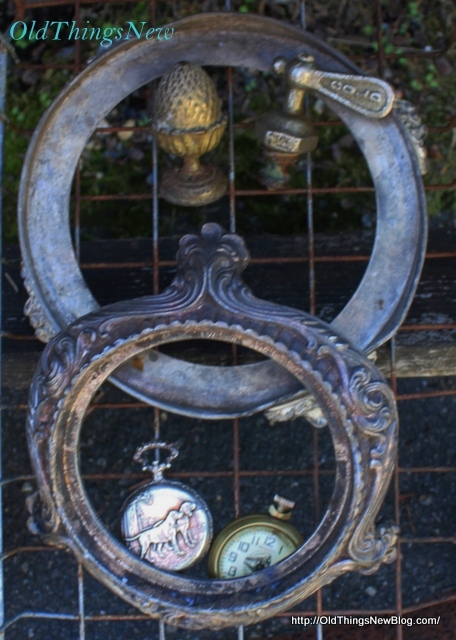 . . perhaps the pocket watches I found on this junking trip will be a part of my New Year’s display. Happy clocheing to you! « Fabulous Tickled Pink Friday Features . . . I’m so Inspired! 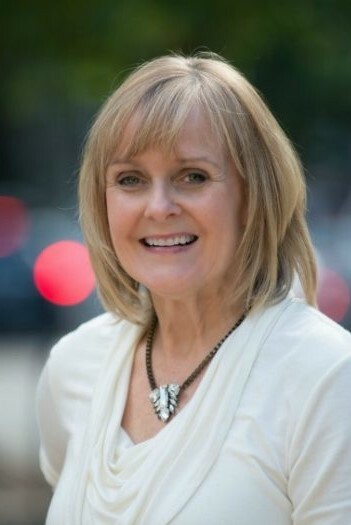 Patti, these photos just made me happy! Love what you did…had to pin! These are fabulous Patti! I love the funky junk you used on top! I have some chicken wire in the basement. Now I just need cool junk! Love your fabulous cloche’s! They don’t look like junk to me 🙂 Such a clever mix of different materials to make such a statement .. that changes with the seasons! Love it. Will do this week. Thanks for the inspiration. Those are just glorious, love them! 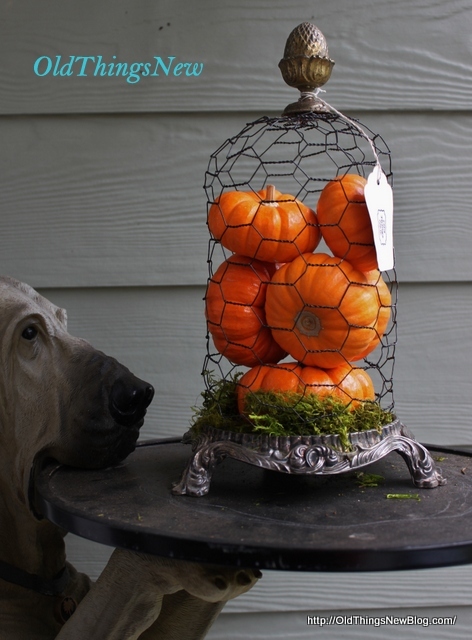 Your chicken wire cloche is just adorable. There are so many uses and so many different ways to decorate one. Very inspiring! I love how these turned out!!!! Tooo cute! I love them, very creative. I absolutely love this idea. I adore all of your work! These are gorgeous! So brilliant! I love how versatile this project is! Great for any season! Thanks for sharing this at Frugal Crafty Home Blog Hop! 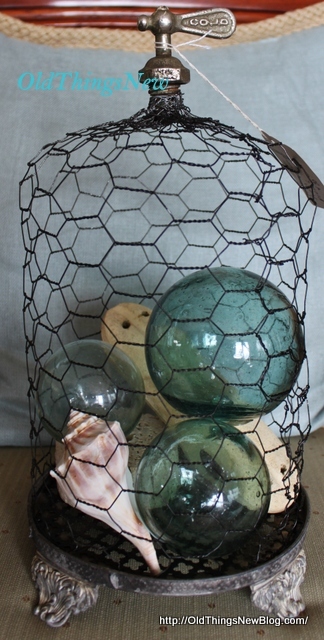 I L O V E your cloches and really want to try to make one. I envy your creativity! You did a great job of documenting each step. I am pinning this for sure! Love all your cloches!! You are so creative. Each one is so different, love them all! Thanks for sharing! What a great idea using the bases and toppers. So unique and creative! Love how yours turned out. I made these a few months ago and was surprised at how easy it all came together. I just couldn’t figure out how to add the knob. Thanks for the idea…very beautiful! 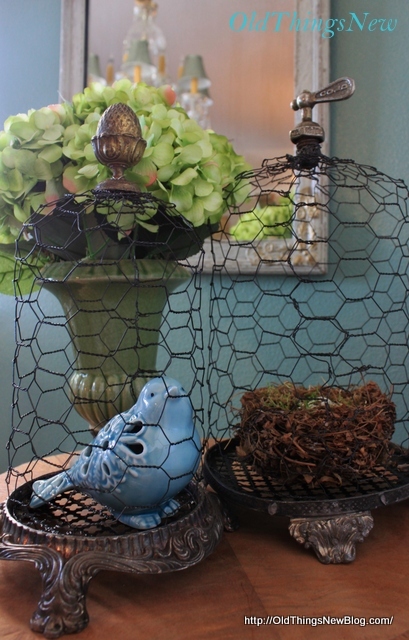 I’m so impressed with how you made the chicken wire not only so perfect, but the items used in the whole projects. You had me at perfection! Now I just LOVE LOVE this!! and I have some old rusted chicken wire under hubby’s barn!! Fantastic creation…thanks for the inspiration! Oh boy am I loving your cloches, especially the awesome toppers. Love that you used old stuff and made it seem so special. I’ve got to get some of that metal screening or whatever it’s called you used for the bottoms. So awesome, I just love your home made cloches. 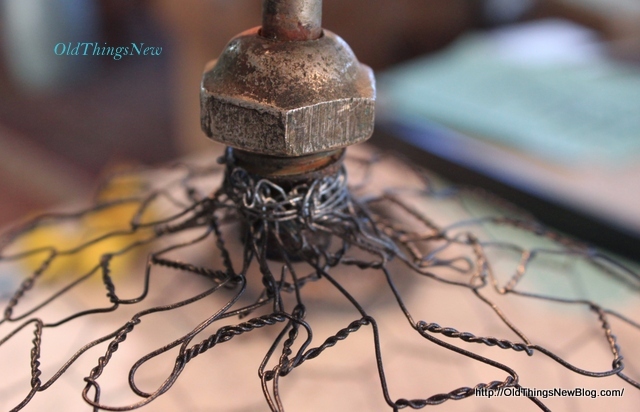 I’m nuts about wire anyway and cloches so your post really got my attention. 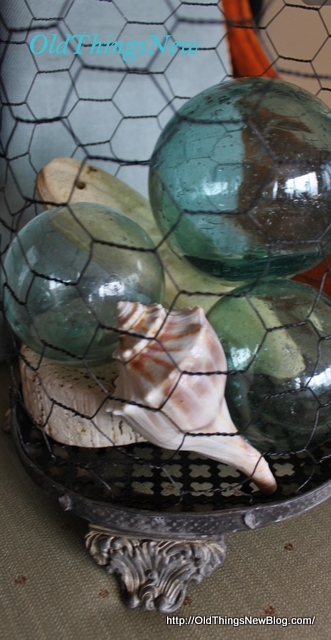 I use cloches quite often, Try to find a way in all my arrangement no matter what room they’re in. Recently I got two of the smaller cheese plate glass covers for $1 each, you can believe I grabbed those babies in a heart beat. I have a bigger one that’s more for a cake I guess. 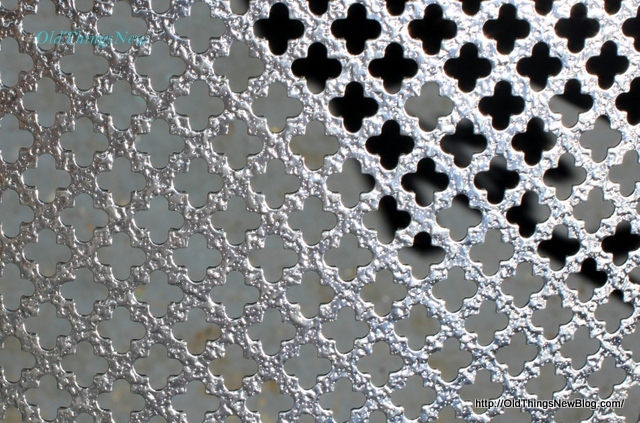 I can see my glass cloches with that metallic screening as a base, awesome. I love getting such great ideas from all the blogs I am lucky to visit. It’s just too much fun. I can hardly sleep with all the inspiration out there. What a great life. I also made a couple glass cloches with a thrift shop hurricane container turned upside down and another was part of a lamp. I got a really pretty glass knob at HL to put in the top hole, glued it in with E6000 and hubs cut the screw off. Loving those two a lot. On the hurricane I had a small glass like fancy dish I glued on the pedestal then another glass knob. Thank heavens for HL’s 1/2 off knobs. I love my cloches. Love this!! You’ve been featured from Give Me The Goods! I was wondering about that step also of scrunching and cutting. Thanks for asking my question Aimee and thanks Patti for your answer! Cool idea – I love the idea of making my own cloche! These are the coolest cloches ever! You are so brilliant, I can’t wait to try this! I don’t have pretty acrylic nails though, 🙁 Thanks for the great tut! Wow Patti! I love cloches and these are amazing! You really had a vision on this one! I highlighted this post tonight on centerpiece Wednesday…I am freaking out over your creativity…I looove how these turned out! I want one!!!!! Patti, These are so creative and really amazing! I love the faucet top. Check out this weeks Open House party for your feature and drop by to enter my giveaway for a 12 month on-line painting furniture course. I know you were excited to find these things – you’ve done an amazing job creating these cloches – I will be featuring your post in this week’s Home and Garden Thursday. So cute!!! I really would love to try my hand at something like this. I am in love with these cloches. I bet you had fun making them too. Thank you so much for sharing at Redouxinteriors. Featuring tomorrow! Party starts at 2:00 PST. Ummmm you are too cool for words! I seriously love these!! So fun! Pinning! How creative can one be? Oh my goodness! 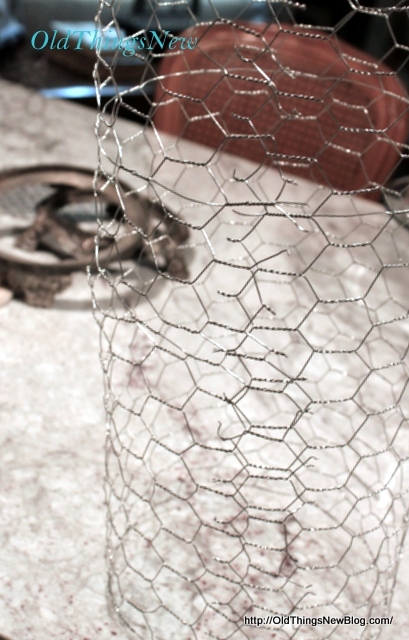 I consider myself somewhat creative but to construct a cloche from chicken wire…really? This is absolutely gorgeous! These look fantastic but you lost me after you made the one long tube and then scrunched. It looks like a hour glass Did you actually make two cloches and cut the apart at that point? Coming over from Redoux! 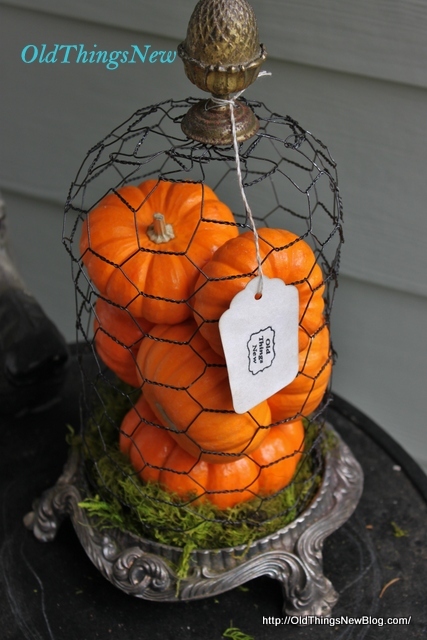 Love, love, love the chicken wire cloche. Absolutely amazing and so creative! Brilliant! I found you at Redoux! So impressed, love them! 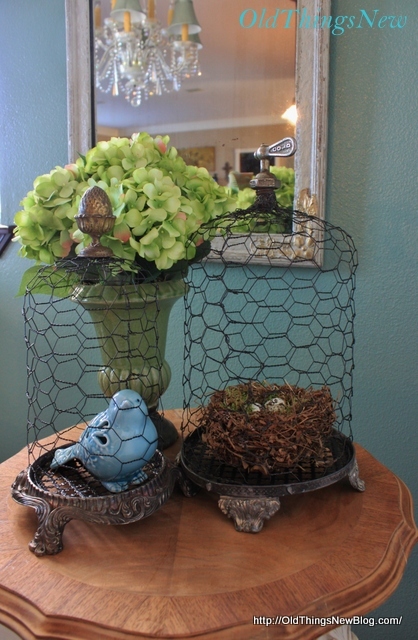 chicken wire is hard for me to work with, too fun to think of what to fill them with next? Patti, your cloches are just over the top gorgeous! 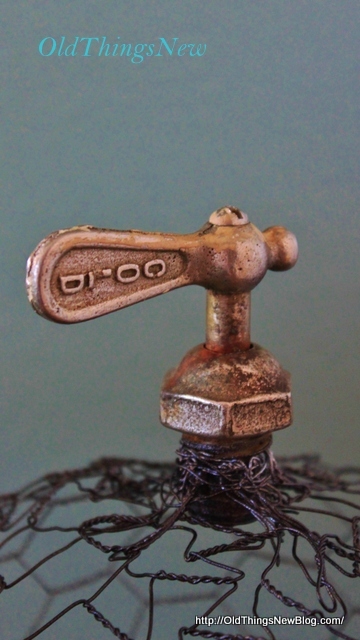 That old faucet handle? ….. GENIUS!!!! I love love love these! Awesome job! Just love all of them. You are great with the chicken wire. Would love to make one, thanks for sharing. 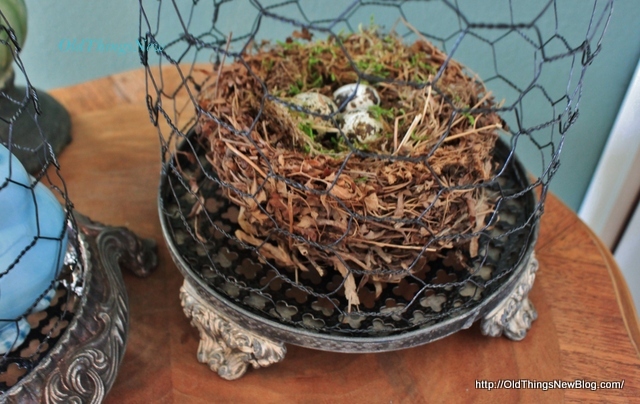 I have been looking at a lot of instructions for chicken wire cloches, and what I love about yours is, you ended up making two at once, and, instead of cutting the top and wiring a bunch of it together to fit the glass shape you had it on, you crushed it…..much easier….have not tried it yet, but looking for my chicken wire to do it. Merci de ce partage ! It’s o good idea ! Cette grille semble facile à réaliser (je vais donc essayer) et les idées sont très sympas. What were the bases used for those? I’m not sure what the silver placte bases were originally that I used in in my chicken wire cloches. I found them in the back yard of a junk store. Perhaps they were part of some kind of serving ware?